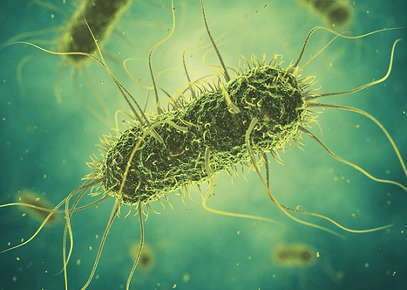 Salmonella is a bacterium that can cause disease in humans, dogs, cats, and other animals. It can cause a variety of symptoms, commonly vomiting and/or diarrhea, but also severe infections and septicemia. It can also cause abscesses, meningitis, bone infections, and abortion. Salmonella is found worldwide and is commonly associated with contaminated food, reptiles, and birds. Epidemics of salmonellosis in migrating songbirds in the spring can create disease in bird-hunting cats. Most, if not all, reptiles carry Salmonella in their intestines, and occasionally shed it in their feces. The bacteria usually do not cause disease in reptiles, but a growing number of Salmonella infections each year in people can be traced to pet reptiles. It is virtually impossible to eliminate Salmonella from pet reptiles. Rarely, contamination of commercial dog food or treats with Salmonella has occurred. More common, a popular fad diet of feeding raw food for dogs and cats has caused illness in pets and the people in the household. A study showed that families that fed raw food to their pets had a much higher incidence of salmonellosis in the people. Contaminated human food can also be a source of Salmonella, especially raw eggs, chicken, and undercooked meat. Even lettuce, fruits and vegetables have been incriminated. Food can become contaminated if someone infected with Saclmonella handles it without washing his or her hands. Treatment of salmonellosis in the milder cases may just involve oral antibiotics. More severe cases will need hospitalization with intravenous fluids and antibiotics. Recovering patients may shed the bacteria in the stool for six weeks or longer. EDPR is dedicated to finding each and every dog in our care their forever home. Please review our Adoption Checklist & fill out the application. By fostering, we are able to maximize our ability to help dogs in need, prepare them for their furever homes, and save lives. Please review our Foster Guide & fill out the application. View our dogs that are ready to find their forever home.